14 days ago *whistles* Only 12 more levels of MW than I need to get to 15. Guess I could do it as a hurrah when I'm almost at PP. And that's ... between 196 and 220 cp. Probably 200. 14 days ago My husband likes to pile up large amounts of his Salon quality for just that reason; to be able to invite the Captivating Princess when the opportunity arises. 13 days ago I've done it once. As it happens, I was in need of a substantial boost to get to MW 54, and it worked. Several MW levels were wasted, however. 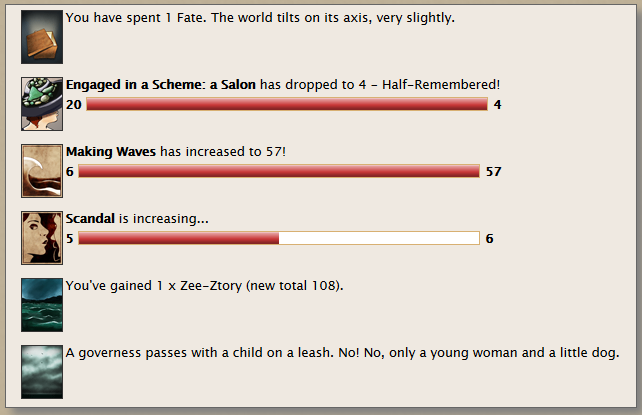 13 days ago I'm slowly working my way up to Salon Scheme 77, because of... reasons. 13 days ago There's zero percent chance of an "Invite Mr. Eaten to your salon" storylet, sadly. There's zero percent chance of an "Invite Mr. Eaten to your salon" storylet, sadly. Anyone else's Goat Farmer extension stopped working? The member who kindly revived it did say it might need deactivating and reactivating when the browser was updated. I've gone through that process at least once.